The EBONY String-Tie is a wonderful product that has many advantages for use. - Does not allow your strings to damage your tie block ornamentation. Enjoy this video below from String-Tie to view the installation instructions in Spanish with English translation. Tenor String Ties For Life!!! First of all I would like to say, I just recently discovered Strings By Mail and discovered that they’re not far from me here in Michigan!!! They are Kind, Timely, Know their products and Have Great Prices!!! Tenor String Ties are the Coolest Thing I’ve seen in a long time.. they turn ANY string into “ball end” strings which improves the Break Angle and may even allow you to lower your saddle (action) a bit. Tenor String Ties are Durable, Low Profile, Stop bridge damage and Add To the quality of your guitars sound and the Very Best Part is, No String Slippage at all, Zero!!! Strings By Mail sell them at the Lowest Price out there!!! Strings By Mail is Hands Down the Very Best Music Product Source and Great CustomerService!! !✌🏻&❤️, Kevin R Daniels, Singer/Songwriter. They were easy to install, work great and look great. I think the guitar even feels a little better, more string vibration resonating in the body.I wish I had known about these a long time ago. I've used these on several guitars now, both Cedar and Spruce, single and double topped, as well as six and twelve string tie holes. I notice absolutely no degradation in tone nor playability. For all intents and purposes they are sonically invisible. They do, however make string changing faster, and appearance somewhat neater. 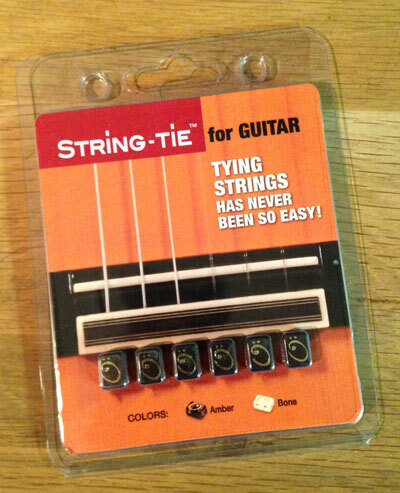 If you struggle with, or simply are not patient enough to knot your strings, this item eliminates that problem.